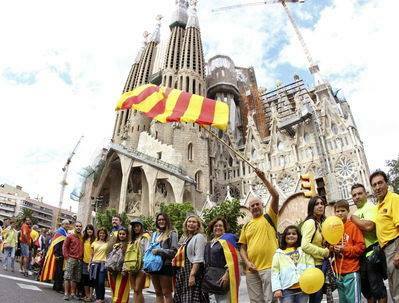 Catalonia is getting ready to commemorate the tercentenary of a defeat. It was a huge defeat that led to the loss of the nation’s liberties, the extinction of the country’s institutions, and an enormous crackdown on all levels aimed at destroying us as a people. Three hundred years later, however, this defeat, which has caused so much suffering to so many generations of Catalans, can only be seen as a great victory. This is because, three centuries after the disaster of 1714, not only has Catalonia not lost its national consciousness, but, on the contrary, that consciousness is more alive than ever, since our country is now close to deciding, freely and democratically, our future. At the very gates of this decisive process, it is essential to let the world know that the desire of Catalans to be masters of our own fate is not just a bolt out of the blue caused by a brutal economic crisis. The greater world must be aware that our nation has a thousand of years of history, and that the desire for the freedom has endured ever since the defeat of that fateful September 11, 1714. The world must know that the future of Catalonia is not against anything or anyone, and that Catalonia’s liberty will help to make the world a little more free. The vast expansion of social media has changed the role of blogs drastically, and there are those who now consider blogs to be obsolete. When I began this site in 2008, it certainly loomed much larger in my confrontation with the world than it does now. Longtime readers will have noticed the much-decreased frequency of posts here as Twitter and Facebook have become quick and easy release-valves for ideas, links, questions, and general contact of a virtual kind. However, as some of you will know already (thanks to those very same media, in which my reach has, like that of many, grown almost shockingly large), I have changed my base of operations to a spectacular seaside town in Catalonia. The cultural impact of this may cause me to post more in this space, since the stimulus of the environment may call for this kind of outlet more often. For example, I can’t avoid commenting on the irony of my new street address (a ceramic sign for which can be seen at the head of this post). The complicated relationship between Cuba and the United States did not by any means begin with the deranged state of affairs of the last half-century. The results of the Cuban revolution that are unhappy have sometimes been taken personally by me. As the person responsible for the current-events bulletin board in my sixth-grade class at Miller-Perry Grammar School, I plumped vigorously for the victory of that pro-American democrat, Mr. Castro. He was even a guest on Edward R. Murrow’s indispensable television show, Person to Person, in which the t.v. cameras went into the celebrity’s home and talked with him informally. Castro’s good English and calm demeanor soon became much less in evidence, of course — not to mention his hospitality to media, except that controlled by him and saturated with his phenomenally prolix orations. 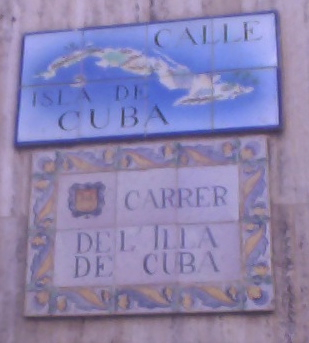 But other countries, without condoning the darker side of Castro’s rule, have had a much saner relationship with that remarkable island and its people. That doesn’t mean that their relationship was less complicated, however. One of the greatest blows that Spain has ever felt was over the loss of Cuba as a prime colony. That deprivation was felt differently in Catalonia, where the loss was not one affecting national pride so much as the pocketbook. 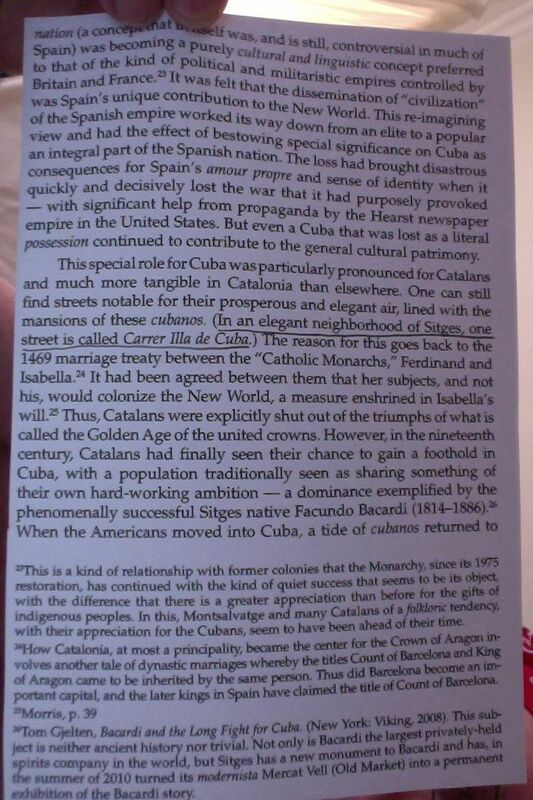 For Catalans were heavily invested in Cuba, and in more than one sense. 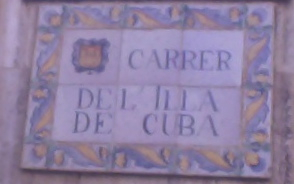 They not only were exploiting Cuba for financial gain, resulting in massive fortunes, but many Catalans developed a deep love for the Cuban people and their ambience. Thus, with the Americans driving out citizens of Spain, these magnates returned to Catalonia determined to recreate, back home on the Mediterranean, their prized Caribbean felicity. They built elaborate villas with romantic walled gardens refreshed by both Mediterranean breezes and the sound of habaneras. This development coincided with the climax of a historic renewal of specifically Catalan cultural vigor known as their Renaixença. A Catalan friend who lived through those times has sometimes mentioned to me this matter of pride for him: while the fascists tore down the Catalan signs in the late Thirties, the restored public use of the language has resulted in street signage in both languages — the dictatorship’s signs simply being supplemented by the Catalan ones. It might have been perfectly understandable if the previously imposed signs had been torn down, even as a sort of symbolic revenge after years of cruel repression; but that did not happen. This is more than a statutorially monolingual culture being replaced by an actually bilingual one; it is the difference between intolerance and tolerance. And it implies much else that makes it a joy to live in this place, among these people.